Killearn Lakes Plantation and its conjoined subdivisions make up the hottest neighborhoods for home sales in Tallahassee. Whether its the A-rated schools, the walking and nature trails, the Tom Fazio golf course, or just the style of the homes, Killearn Lakes is a destination considered by homebuyers for years. 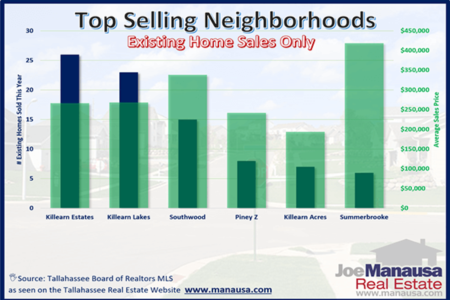 Due to the segmentation of Killearn Lakes in the Tallahassee MLS, it "only" shows up among the top 3 neighborhoods each year. But when you include all of its enclosed communities (Deerfield Plantation, Deerwood Plantation, Golden Eagle Plantation, Killearn Commons, Kinhega Landing, Kinhega Oaks, Pine Landing, Scotswood, Seven Oaks, and The Glen at Golden Eagle) which are often reported separately, this area of Tallahassee has posted the most home sales in town. 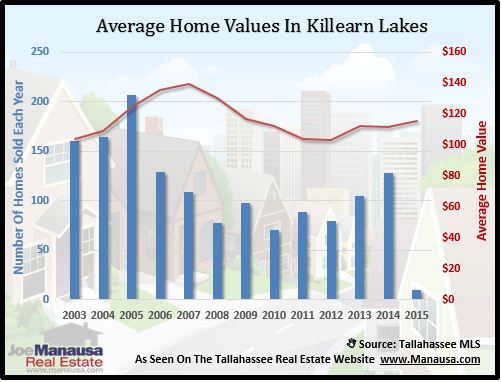 In this report, we will look at prices, values, and sizes of homes in Killearn Lakes Plantation, as well as show current listings in the Tallahassee MLS and all closed home sales going back to 2002. For the 3 housing graphs provided in this report, you will see the number of closed home sales for each year (blue columns, measured on the left vertical axis), and an important real estate statistic shown in red (measured on the right vertical axis. It is important to note that sales are through December for all previous years, but through mid February in 2015. 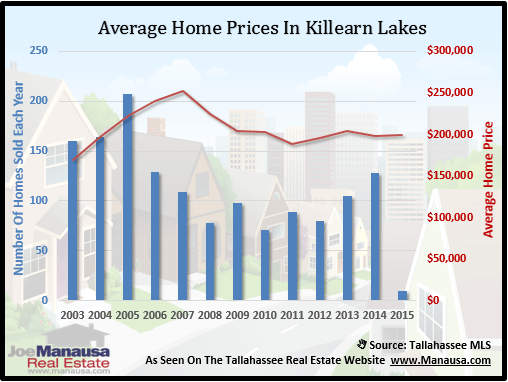 The average sales price for a home in Killearn Lakes Plantation has not changed very much since 2009, reaching a market low in 2011 and recovering only slightly since. Price now are just 6% above the bottom, and still down 21% since they peaked back in 2007. 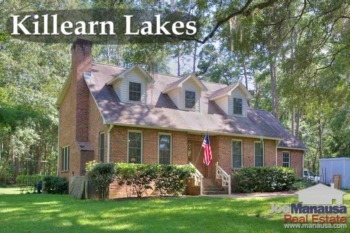 The average recorded sales price is $198,700 for Killearn Lakes Plantation thus far in 2015. Home sales activity was robust in 2014, but still somewhat lower than the levels recorded during the most active years from 2002 through 2005. Thus far in 2015, there have been 10 closed home sales in Killearn Lakes Plantation. Average home values in Killearn Lakes are up 4% in 2015 versus 2014, and have risen 8% since reaching a market bottom in 2012. Many home sellers are still dealing with negative equity, as values today are 20% below the level recorded at the peak in 2007. Through mid February, the average value of a home sold in Killearn Lakes Plantation has been $116 per square foot. 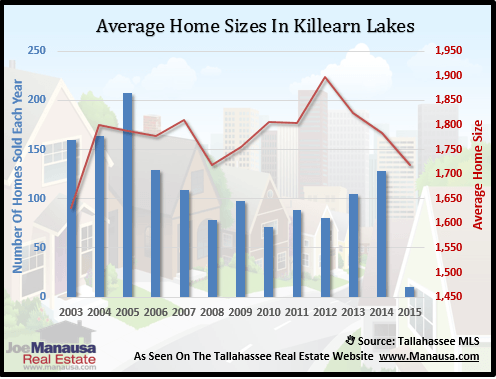 The average home size sold in Killearn Lakes Plantation typically falls in a range of 1,700 to 1,900 square feet, and it appears as if the 2015 homebuyers are seeking out the smaller homes so far. The 10 sales thus far in 20154 have averaged 1,719 square feet. The following list of homes are the most recent listings in Killearn Lakes Plantation. The following list shows home sales going back to 2002 in Killearn Lakes Plantation. I hope you enjoyed our February 2015 update on home sales in Killearn Lakes Plantation, please feel free to drop me a note if you have questions not covered in this report.